It was one of the most popular posts ever on my blog, generating more comments and questions than other (and in my opinion) far more controversial topics, but what genuinely surprised me was the question that wasn’t asked. More so than what instrument, be it piano or violin or other, the mode of instruction was never brought up. Was it taken for granted by all that the learning context would be inspired by el Sistema? Or perhaps it was simply assumed that my daughter’s music education would unfold conventionally, in ways consistent with the Western European pedagogical tradition in which I myself was trained: private lessons at the start, with an eventual expansion to include ensemble, instrument permitting. For those who keep asking me the outcome of the instrument question, my daughter has yet to celebrate her second birthday so the question as much as the resolution remains premature. I might defer necessarily to my wife, since I know she would take great pleasure in introducing our daughter to the piano, and the extent of my violin training is Suzuki Book 1. That said, I would like to improve my violin skills, and I can think of no better to way than to learn in parallel with, or better, in the company of my daughter. There might be no better way for my daughter to learn too than to have a parent struggling beside her on the same tasks, facing the same challenges, yet (hopefully) able to model practice techniques accumulated with the benefit of hindsight. If nothing else, the experience will make me much more empathetic to both her and the process, which will hopefully make me a better educator as well. They say that to remember is to understand, and the greatest problem with teachers is that most don’t remember or, in the case of the exceptionally gifted, simply don’t know how difficult the process of learning can be, and thus fail to understand how students can struggle. And if I compel myself to remember, the fact of the matter is that my initial hours spent learning the piano, my first instrument, were grudgingly given and motivated only by the pressure of my parents, most often manifested psychologically but sometimes physically through the medium of an accelerated wooden spoon. I occupied my mandated daily half hour by playing through things as best I could, trying to play fewer wrong notes each time without any conscious strategy or method, in a pseudo-Bachian optimism that if I were to hit most of the right keys at roughly the right time, the device would in fact play itself. My obligation fulfilled, I immediately turned my attention to far more stimulating and rewarding pursuits, like Lego. With little plastic bricks I could create the most wondrous things, (limited only by my imagination and the finite but ever-growing number of pieces I possessed) tear them down and begin anew. My disinterest in piano was not the fault of my teacher, Shelagh Scott. Rather, I’ve come to recognize that she was a paragon of her profession, extremely conscientious and evidently extraordinarily capable if she were able to impart so much to someone so reluctant, and I name her as both endorsement and gesture of respect and gratitude. I left her studio (selected by my parents, as 99% of parents do, for its walking-distance proximity and thus utmost convenience) uncommonly musically literate and with a surprising degree of proficiency, despite my best efforts to the contrary. I never won the year-end prize for the best student (my sister took that once, in fact) nor am I even close to being her most accomplished pupil, decades later. I just didn’t enjoy piano. There was a fundamental disconnect between me and music, not just me and the instrument. Piano was something that had to be done, like homework. They told me I was talented, as is their wont when it comes to encouraging children, but flattery is a transitory motivator. 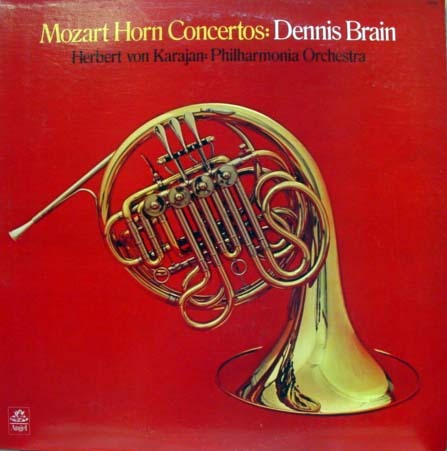 I don’t even know why I stuck with it through three other teachers until my early teenage years, when I was finally captivated with the sound and appearance of the orchestral horn, due in large part to an LP of Dennis Brain performing the Mozart Horn Concerti. My school didn’t have any music program, so the leap to a wind instrument was a very serious one financially. To my parents’ immense credit they purchased a horn for me before I had any experience with the instrument. Clearly, I didn’t know what I was getting into. You leave us all haning on that last line. Such a device. Probably the best way to end a lesson as well.